Shortly before Steve Jobs returned to Apple, the company developed a range of personal digital assistants called Newton. These handheld devices were supplied with a stylus and designed for handwriting recognition which actually worked for neat writers like myself but drew derision from scrawly types who had great fun mocking Newton’s wildly inaccurate interpretations. Newton was powered by a couple of standard AA cells which ran for months. The device, popular with early adopters and Apple ‘fan boys’ during the late 90’s, emerged around about the same time that British inventor Trevor Baylis came up with a production version of his wind-up radio – A device designed to bring radio to people in Africa where batteries were prohibitively expensive. This got me thinking about the possibility of a wind-up Newton. So, I mocked something up in Photoshop, wrote a blurb and put it on the internet. To my surprise (and delight) people took it to be genuine. Even Apple Fellow Guy Kawasaki was duped by my Apple Clockworker Ad and included it in his weekly Tidbit ListServe Digest that was pushed out to subscribers around the globe. 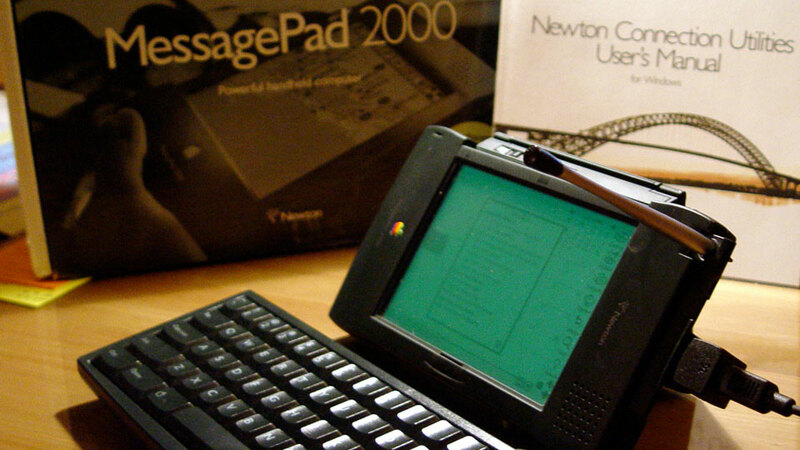 Shortly after his return to Apple, Jobs killed off the Newton in order to concentrate the company’s R&D efforts on what would become the iPhone and Newton’s logical successor the iPad. Originally published in 1997, I had quite forgotten about my Baylis-inspired Apple Clockworker Ad, until today, when I heard about the death of the inventor in a radio announcement. RIP Trevor Baylis. Your invention achieved far more than any spoof ad. Your wind-up radios delivered a life saving anti AIDS message to the digitally disadvantaged across the African continent. Here is a transcript from the original XPOhaas webpage published in 1997. The ClockWorker(tm) from Apple Computer heralds the beginning of a new chapter in the development of PDA (Personal Digital Assistant) technology. This is no run-of-the-mill PDA, but a revolutionary concept in mobile computing. Whilst other computer manufacturers around the globe have been wrestling with the issue of developing more reliable battery technology, Apple Computer have successfully adopted an alternative power source developed by engineers in the United Kingdom. As its name implies, the Apple ClockWorker is powered by a simple clockwork mechanism housed in the base of the unit. Only twelve turns of the integral AppleKey(tm) are required to provide enough power for up to three hours continuous use. This new generation Newton(tm) represents the first practical application of Apple PowerSpring(tm) technology which has been under development since 1993. Trials are also under way to evaluate the viability of using this technology in full-sized laptops. The clockwork mechanism provides enough charge for processing power undreamed of in previous PDA’s. The Apple ClockWorker features a custom-built 300Mhz RISC ARM processor, 30Mb RAM and an integral 70Mb supercapacitor memory chip. This powerful configuration clearly raises the bar on hand-held multimedia applications and real-time handwriting recognition. Although the quartz display is exactly the same size as the popular Newton 2000, it now supports 256 color and offers greater cursor precision when used in conjunction with the new ergonomically designed stylus. ClockWorker is available in grey, black or alluring transparent green perspex. A lightweight metal alloy version has also been developed for use in hostile environments and the device will certainly find favour where reliable power sources are unavailable. The ClockWorker is believed to have been extensively tested in battle conditions in Central Europe. An optional PCMIA card provides GSM connectivity for Internet, E-mail, fax and standard telephone services. One of the most impressive features of the ClockWorker operating system (a subset of MacOS) is the way it has been tightly integrated with PlainTalk, enabling the user to issue verbal commands to the unit. The PDA can read back e-mail messages and can even be scheduled to make telephone calls on your behalf. In fact if any single Apple product comes close to the revolutionary concept of the company’s ‘Knowledge navigator’ promo, then it must be Apple ClockWorker. Apple, ClockWorker, AppleKey, PowerSpring, Newton, PlainTalk, MacOS and Macintosh are registered tradenames of Apple Computer Inc. All registered tradenames and trademarks are acknowledged and recognised.